Charlie and the Chocolate Factory (1964) is one of Roald Dahl's beloved stories about a poor boy named Charlie Bucket who wins a chance to tour Willy Wonka's Chocolate Factory, every child's dream. 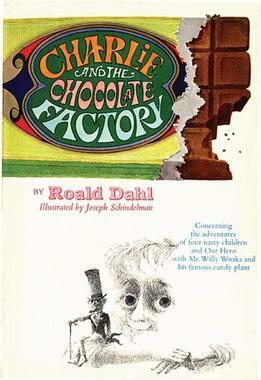 The book was adapted into an instant-classic movie, Willy Wonka and the Chocolate Factory (1971) , starring the brilliant actor, Gene Wilder as the eccentric chocolatier. Mr. Wonka had closed the factory after discovering spies were trying to steal his chocolate recipe, then announced in the paper that five lucky children would be allowed to tour the factory if they found a golden ticket in a Wonka chocolate wrapper. The first four golden tickets are found by the gluttonous Augustus Gloop, the spoiled and petulant Veruca Salt, the gum-addicted Violet Beauregarde, and the TV-obsessed Mike Teavee. Charlie seems least likely to win, since his family is so poor and unable to afford a luxury like chocolate, but one day he sees a fifty-pence coin buried in the snow, buys himself a chocolate bar, and finds the fifth golden ticket! The rules state that each child can bring one family member for the tour-- Charles decides to bring his fun-spirited Grandpa Joe. Dahl published the novel's sequel, Charlie and the Glass Elevator in 1972, and had planned a third novel, but it was never published. We look forward to when we can publish Dahl's many brilliant works as part of our collection of public domain literature.